Criterion revisits two Akira Kurosawa samurai classics from the early 1960s, bringing them "up to code" in new Blu-ray editions. As usual, the gain in picture and audio quality makes these carefully mastered editions very attractive. 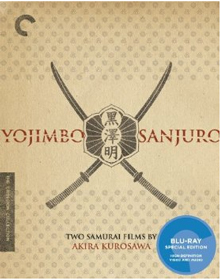 Before we saw Yojimbo we already knew that it had provided the template for Sergio Leone's first Spaghetti Western Fistful of Dollars, just as John Sturges had 'adapted' another Kurosawa samurai epic, Seven Samurai. But the two movies are much more than just similar. Leone remade Yojimbo scene-by-scene, joke by joke and practically shot by shot. Not to denigrate Sergio Leone's talent, but I don't know of another filmmaker whose breakthrough picture is such a blatant exercise in plagiarism. The story is a cynical look at unbridled competition in the Old West. Mysterious ronin Sanjûrô Kuwabatake (Toshirô Mifune) drifts into a hamlet split into two warring clans, each of which has taken on a retinue of hired swords to harass the other. Sizing up the situation, the stranger makes deals with first one side and then the other, cutting the private armies down to size and quickly amassing a pile of mercenary loot. A monster hit in Japan, Yojimbo originally attracted its share of put-downs from homegrown critics. Most previous samurai tales were serious costume epics but Kurosawa envisioned his film as a samurai-western hybrid even more American in tone than his earlier Seven Samurai. Ironic humor and bloody conflict are everything, while historical context and moral examination are mostly absent. It's immediately obvious that this is something new when our ragged samurai hero walks down the road to music that sounds like swing jazz. Ozu who? Japanese critics already thought Kurosawa's ordinary films were too Western, and with Yojimbo he totally broke the mold. Paced more like a comedy than a period picture, this swordplay free-for-all invented a new style of super-hero samurai warrior. The entire enterprise celebrates mercenary cynicism, as Sanjuro precipitates bloody battles between two warring super-powers, cleverly taking money from each. Toshirô Mifune plays the character lampooned by John Belushi on vintage Saturday Night Live skits -- forever scratching himself and pulling his arms inside his tunic. Aloof, calculating, Sanjûrô always has one more trick up his sleeve. Just as in Leone's Spaghetti Western remake, the character isn't a clown. But most of his shenanigans win our approval and make us laugh as well. The story is structured as a farcical fairy tale: the cagey Sanjûrô (Yojimbo = bodyguard) hires himself out to one warring faction, causes some mayhem, and then switches sides. Pretty soon he has both sides annihilating one another while he sits in the middle getting rich. But he isn't totally bad: Along the way Sanjûrô makes friends with a neutral barman, and helps an innocent couple escape the clutches of one of the evil families. Like James Bond, we know Yojimbo won't get killed. The formidable Tatsuya Nakadai plays Unosuke, Sanjûrô's only real opponent. Somewhat of an anachronism, Unosuke carries an American pistol in the folds of his clothing and adorns himself with a plaid scarf. The character has been described as the film's proto-Yakuza. Even as we marvel at the lightning-fast swordplay, we never take Yojimbo all that seriously. In one outrageous sequence with the warriors lined up for combat, one giant fighter carries an oversized Yosemite Sam-style mallet. I'm informed that such a weapon was indeed real, but it's hilarious just the same. Kurosawa's storytelling style plays clever tricks with the pacing. The picture slows down for long stretches, only to burst into fast action at a moment's notice, and then subside again ... and the relaxed segments get shorter until the expected violent climax. I'm not kidding about the 'similarities' between Yojimbo and Fistful of Dollars: Sergio Leone's western closely follows Kurosawa's script, and changes only a few details. Actually, Kurosawa's film has also been noted as an adaptation of Dashiell Hammett's Red Harvest, so where the borrowing began is a subject for debate. Legal trouble apparently contributed to a delay in the American release of Fistful -- we're told that after negotiations made Kurosawa a profit participant, Fistful became one of the Japanese director's biggest 'moneymakers,' helping him finance independent productions like Red Beard. 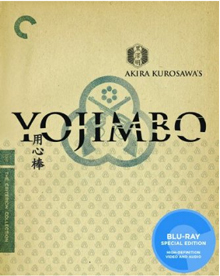 Criterion's Blu-ray edition of Yojimbo gives us a stunning copy of the popular action film and retains the earlier special edition's set of extras. The extras inform us that Yojimbo introduced custom Whoosh and Slash sound effects for its whirling samurai blades, making each of Sanjûrô's killing sprees sound like music from an angel's flaming sword. Author Stephen Prince provides a thorough and entertaining commentary. The teaser and trailer are here along with some stills, but the main attraction is a 45-minute installment of the TV Toho Masterworks series Akira Kurosawa: It is Wonderful to Create. Former collaborators of the director give us a run-down on his personality as well as relating anecdotes about the filming. Kurosawa used wind machines to throw up dust but insisted that his actors not shut their eyes; he auditioned the odd-matched music by first placing it in the film's trailer. Witnesses describe Toshirô Mifune as a perfectionist and an agile action performer who really could slash his sword around at a rate of 1 killing per second (KPS?). We learn of Kurosawa's interest in shooting the entire picture with telephoto zoom lenses, a choice that required a focus puller with magic fingers. The docu explains Kurosawa's cynical new style by recounting how he came up with the arresting image of a dog carrying a severed hand. Although nobody says it exactly, Sanjuro appears to have been created in a hurry to follow-up the hugely successful Yojimbo. It's a very different and amusing samurai adventure, even though Toshirô Mifune's Sanjûrô character has been shoehorned into a story originally about a meek fellow that wins the day but isn't a polished swordsman. The adaptation is excellent, as Mifune's itchy warrior shepherds a group of foolish but well-intentioned samurai and relies on a series of clever strategies to save the day. The story is more refined than the more cynical Yojimbo. Sanjûrô (Mifune) comes to the aid of nine good but impressionable samurai who have wrongly decided that their ugly chamberlain is a villain and the friendly superintendent is a friend. Sanjûrô employs stealth and sharp games-playing to save them from one catastrophe after another. He makes use of an acquaintance with the superintendent's head enforcer Hanbei Muroto (Tatsuya Nakadai) to infiltrate the enemy camp. Eventually it comes down to a few crucial bluffs and Sanjûrô's novel way of signaling an attack: by throwing bunches of Camellia blossoms into a stream. Sanjuro is just as funny as Yojimbo but has fewer action battles; it's mostly an object lesson in cunning and strategy. The nine impetuous samurai fly off the handle at the slightest provocation, and the cagey Sanjûrô's main task is to teach them to look beyond the obvious. At every step of the way, Sanjûrô's wise choices help gain the advantage, in obtaining information, rescuing hostages and keeping the enemy in the dark. The story differs from Yojimbo in that Sanjûrô is committed to one side and only pretends to join the other. Like a ronin Mary Poppins, he comes from nowhere to aid the well-meaning Seven Dwarfs / nine samurai, who judge people and situations by appearances alone. They fail to appreciate that the 'horse-faced' and stodgy chamberlain is virtuous, and are easily taken in by the charming superintendent. The corrupt superintendent plans to overthrow the clan with the tactical aid of young Hanbei Muroto, a mercenary who invites Sanjûrô to help. Of course, Muroto intends to then dispose of the superintendent and take over himself. Sanjûrô breaks the samurai code of honor by acting as a double agent, but it's the only way he can oppose a treacherous foe. Sanjuro gives us a number of amusing characterizations to enjoy while watching Sanjûrô make both the bad guys and the young samurai look like fools. Freed hostage Reiko Dan talks about the joy of lying with her boyfriend in fresh hay, and her mother repeatedly chides Sanjûrô with the adage that he should keep his sword sheathed more often. Sanjûrô considers that advice to be wise, even though he doubts he can act on it. When a house servant volunteers to go back to serve saké to the enemy, Sanjûrô tells his cohorts that she's more of a samurai than any of them. He also complains about the way the nine follow him around: "You guys move like a centipede." In what amounts to a samurai running gag, one of the chamberlain's loyal servants (Keiju Kobayashi) stays hidden in a closet throughout most of the picture. He pops out only to offer advice or pertinent bits of information -- and then pops back into hiding again. According to the disc extras, before Kurosawa reworked the original story for Mifune, this character was the hero! Sanjûrô does its fair share of swordplay slicing and dicing but there's not nearly as much mayhem as in Yojimbo. To compensate Kurosawa ends the show with another novelty effect for the samurai film -- a single fatal sword stroke that results in an outrageously exaggerated fountain of blood. This ultra-cool bit of showoff butchery surely made Sanjuro the hottest thing in Tokyo. It probably inspired the samurai genre to realign itself around stylish flourishes of ritualistic, gory bloodletting. 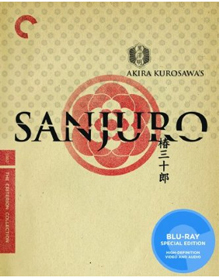 Criterion's Blu-ray edition of Sanjuro again shows how the enhanced detail and contrast of HD improves a viewing experience. The commentary is by Stephen Prince, and the docu is another episode from the Toho Masterworks series. Tatsuya Nakadai, Keiji Kobayashi and a host of crewmembers recall the filming, in which hundreds of fake Camellias were handmade, attached to trees and carefully arranged by the director. Everyone chips in to comment on the extraordinary final scene. The valve for the fake blood didn't function properly, resulting in a geyser that drenched the script lady and almost knocked Nakadai off his feet. It went completely against what was planned, but Kurosawa liked it and kept it. A trailer, a teaser and more still galleries are included as well. The films are available separately and as a double album. Each has an insert booklet with essays by Alexander Sesonske (Y) and Michael Sragow (S), notes from Kurosawa and short pieces by the production designer, assistant cameraman, script supervisor and actors Nakadai and Kobayashi.